As many of you know, this past Fall, OWC Studios chose not to renew its sponsorship of our studio and OWC Studios became Ares Studios. Ares Studios was the name of our studio in CA when we first started, so we are excited to revive the name as we move into 2019 and rebrand the studio space. As part of this rebranding and refocus, we have taken to two different avenues of funding the current $4,000 a month in rental, utilities and insurance we pay. With the help of John Strekis, who acts as producer of our YouTube channel, we have reignited our channel with lots of new videos and TWO weekly shows. Reel Trek at 9pm EST on Fridays, and Axanar Confidential, at 9pm EST on Mondays. Right now we are bringing in over $1,100 a month between ad revenue and super-chat donations. Our Patreon is over $1,100 now and keeps growing! Patrons get exclusive videos and content, live chats and more! So if you want to support the studio, please join in! Together we are making over $ 2,200 a month now which means we have SECURED the future of the USS Ares bridge set, as we are set to move to a smaller, brand new building, right next door, in May. There our rent will only be $2,100 a month. Add in utilities and insurance and we ae at about $ 2,500. Having a lower overhead is important to ensure the long term future of the studio. So THANK YOU! 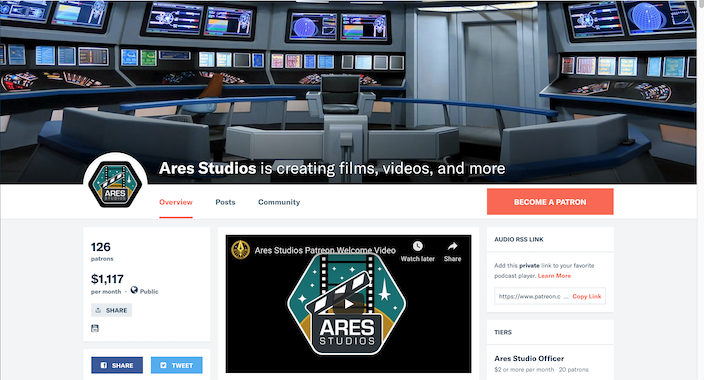 Because of you, Ares Studios is on the rise! I think this is great! It seems that this has actually been a boon for the future of Axanar! The interest in seeing Axanar come to fruition has really driven up interest in it. There is a lot of talk about it now, and that is so exciting! CBS put the Season 2 premiere of STD on their YouTube channel, and overwhelming I noticed that people are disgusted with CBS, and how they have treated the fans (meaning the lawsuit). Keep marching forward, you guys are great. Axanar is real Star Trek!